Rooftop apartments, birds, and jet contrails in a landscape photograph from Antibes, France. In the early morning Cote d’Azur sunlight, the scene shows a warm glow giving an overall sense of quietude and tranquility as the town begins to waken. The buildings appear to be evolved instead of planned, resulting in broken space and a distinctive individuality of the rooftops. They take on the broken reality of an early cubist painting. 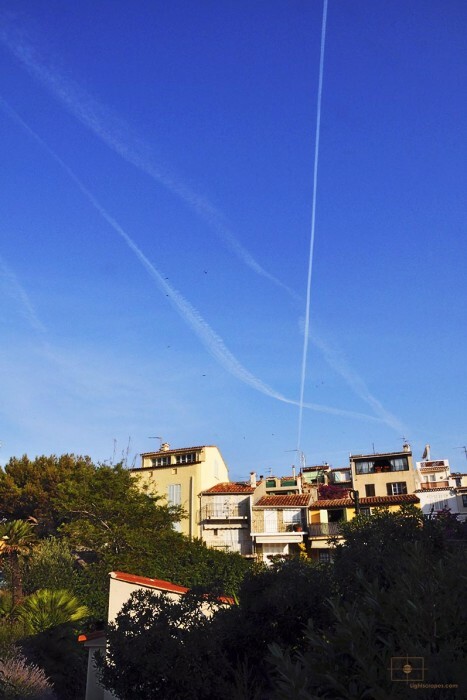 Broad sweeping gestures of jet contrails in sky contrasts to the nervous fractured geometric forms of the rooftops.